Mission accomplished: Friends and Partners with East Timor, led by president Lindsay Stokes, gather for a thanksgiving Mass and dinner at St Peter Chanel Church, The Gap. For the past 18 years, Brisbane parishioners have supported projects in East Timor’s remote Atabae region. 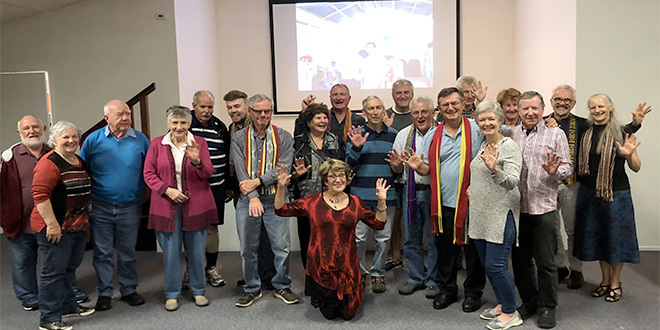 BRISBANE parishioners have celebrated a mission accomplished after 18 years supporting projects in East Timor that have empowered a remote, war-torn Catholic community and yielded lifelong friendships. In 2000, parishioners of St John’s Wood/The Gap first heard about the plight of impoverished villagers in the mountainous region of Atabae, home to about 10,000 people in the west of East Timor. Former army officer, now Deacon Gary Stone was deployed in East Timor and returned to his Brisbane parish with stories of devastation after years of fighting for Timor’s independence. “Everything had been destroyed. The people had been traumatised,” Deacon Stone said. Deacon Stone shared his East Timor experiences, and the St John’s Wood parish quickly responded. 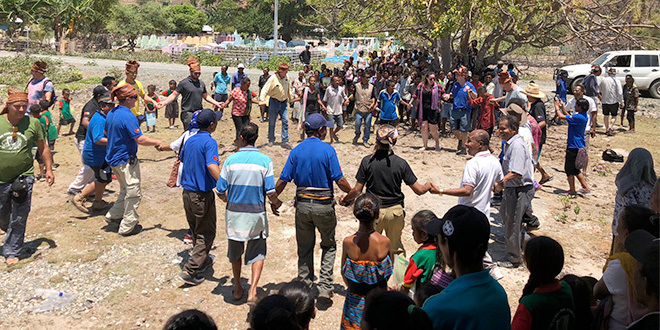 One parishioner, Peter de Haas – now a deacon in Cairns – assembled a group and founded an organisation called Friends and Partners with East Timor (FPET). “We went to work developing friendships with the people of Atabae parish,” Deacon Stone said. “We sent groups of people there and brought Timorese from Atabae out here. Through a partnership with Palms Australia (an aid and development agency with Catholic origins), the Atabae mission started to take shape, with a sharp focus on community development to empower the local people, especially in education and health care. Friends: Brisbane and Atabae parishioners dancing together earlier this year. “We were careful to respond to their needs and offer support where they saw the priorities,” Deacon Stone said. “Hundreds of children received quality education. “Teachers, nurses, tradespeople and priests have been trained. There are many success stories, including support for one agricultural student who went on to introduce new farming techniques into Atabae. During the life of the mission, Palms contributed eight community development workers, whose wide and varied work through parish funding included training the youth in conflict resolution and social skills. “We got to a point last year where we felt our mission was accomplished,” Deacon Stone said. “The people of Atabae were well and truly self-sufficient and we realised it was time for us to decrease, and for them to increase and continue on without having a financial lifeline. Having completed its mission, FPET recently celebrated its long-standing achievements. “We celebrate the ongoing friendship that we have with those people,” Deacon Stone said. “Our executive members Lindsay Stokes, Jim Johnson, Eric Muir and John Ohara, as well as myself and other members of our veteran community have had several visits there this year, and the Timorese continue to be delighted and appreciative for all that we have done. “We specially thank all those who given time, treasure and talent to help our neighbours. With the completion of FPET activities, some members are now directing their financial support to Palms Australia work in other parts of Timor, as well as a vocational training scholarship scheme for children of Timorese veterans run by the Veterans’ Care Association.